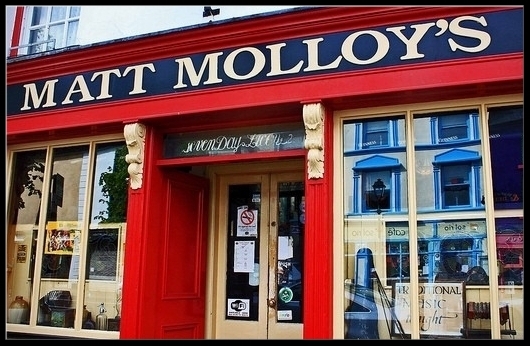 MATT MOLLOY’S IS THE BEST KNOWN WESTPORT PUB IN JAPAN, ALASKA, AND PROBABLY TIMBUCTOO. IN THE COURSE OF THEIR INNUMERABLE WORLD TOURS, HE AND THE ILLUSTRIOUS CHIEFTAINS HAVE BROUGHT ITS NAME TO A VAST AND VARIED AUDIENCE, ALONG WITH A TASTE OF THE TRADITIONAL MUSIC THAT FLOWS FROM IT – DARK, DEEP AND UNPASTEURISED, LIKE ITS PINTS……. IT IS NOT SURPRISING THAT MATT MOLLOY’S BAR OVERFLOWS ALL YEAR WITH VISITORS – FROM THE BEWITCHED TO THE BAFFLED – FROM ALL FOUR CONTINENTS. THOUSANDS MORE WHO HAVEN’T MADE IT TO THE DOOR, HAVE BOUGHT THE CD, MUSIC FROM MATT MOLLOY’S, PRODUCED BY REAL WORLD RECORDS. WHAT IS SURPRISING IS THAT THE PUB MANAGES TO KEEP THE SENSE OF INTIMACY WHICH IS VITAL FOR THE MUSIC TO FLOURISH. KNOWING THAT TRADITIONAL MUSICIANS, LIKE STARLINGS, PREFER COSY NOOKS AND CRANNIES, MATT HAS PURPOSELY KEPT THE PUB SMALL, SO THAT THEY CAN CONGREGATE – AS THEY DO, FROM ALL 32 COUNTIES – TO ENJOY A PINT AND A TUNE. IF HE’S NOT ON TOUR MATT JOINS IN THE SESSION, AND IF YOU HAVE BEEN DAZZLED BY HIS FLUTE PLAYING WITH THE CHIEFTAINS, YOU CAN SIT DOWN HERE FOR THE PRICE OF A PINT AND HEAR THE SAME MUSIC MORE ELECTRIFYINGLY PURE, MORE HAIR-RAISINGLY PERSONAL. THE MAGNET AT MOLLOY’S IS THE ATMOSPHERE. GENERATED BY THE PRESENCE OF MATT HIMSELF, DISSEMINATED BY THEIR FASCINATING STAFF, IT BUILDS UP WITH EACH REPEATED REEL SET, PACKING IN THE CROWDS, THE FAMOUS AND THE OBSCURE PRESSED CHEST TO CHEST LIKE PILCHARDS, UNTIL THE MUSIC IS BORNE ALOFT – AS IT AUTHENTICALLY SHOULD BE – BY A STEAM TRAIN OF CONVIVIALITY. AUTHENTICITY IS THE LAST OF THE WORLD’S HARD CURRENCIES, MOLLOY’S IS COINING IT.